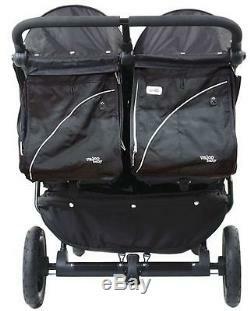 NEW Valco Baby Tri Mode Duo X Compact Fold All Terrain Single Stroller Night. 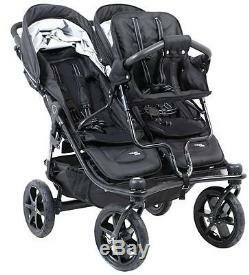 A luxurious and comfortable ride for two or even three in a NEW style! The Tri Mode name has always been known for its unswerving reliability, solidity of build, and ingenuity of features. 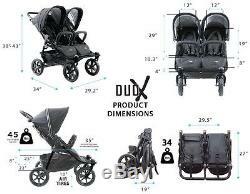 The NEW 2016 Duo X double (or triple with toddler seat, Not Included) stroller builds on this legacy, with improved ease and compactness of fold, customized accessories, and all round performance in a new light-weight chassis. 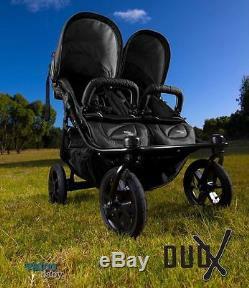 With a smaller footprint, adjustable footrests, low profile air tires and a new'Easy Clean Standing' fold with automatic lock, the redesigned Duo X is the durable All Terrain double to triple stroller you've been waiting for. 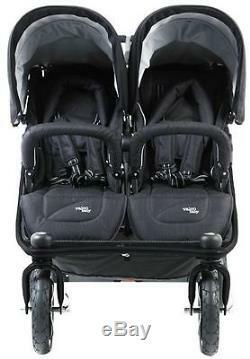 Additional Toddler Seat X (duo, Not Included) available to transform the stroller into a triple. Folds with front bars attached. Extra EX-tended canopy with mesh airflow for super coverage (can zip away when not needed). 5 point harness (NEW buckle). Full infant recline to fully upright seat position. One touch recline with unlimited position in between. Harness Covers (easy to remove). 4 x Low Profile Air Tires (10). Easy access basket (even when seat reclined). Extra Airflow in rear that can be unzipped and rolled up. Tri Mode Front Wheel System Fixed, 45º, Full Swivel. 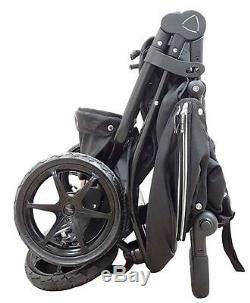 3rd Child Seat Option with Toddler Seat X (duo) Extra Accessory. Fully Loaded: Front Bars, Raincover, Headhuggers. Difference Between Twin Tri Mode and New Duo X. Standing fold with carry handles. Product: 34"L x 29.2"W x 30-43H. Folded: 27.7"L x 29.2"W x 19H. 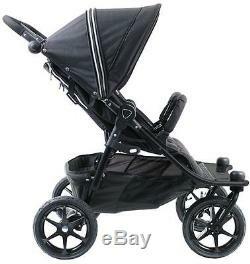 Seat: 10.3"D x 12"W x 19"H (Seat to Hood Clearance: 29"H). 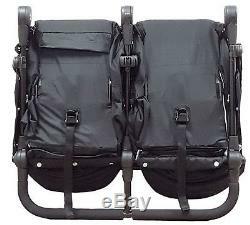 Weight: 34lbs Weight Capacity: 45lbs each seat. 2 x Infant Head huggers. 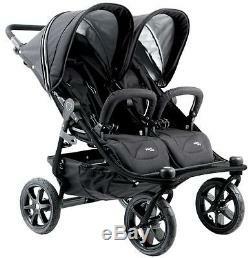 The item "Valco Baby Twin Tri Mode Duo X Compact All Terrain Double Stroller Night NEW" is in sale since Monday, October 9, 2017. This item is in the category "Baby\Strollers & Accessories\Stroller Accessories\Other Stroller Accessories". The seller is "devinesuperstore" and is located in Whittier, California. This item can be shipped to United States, Canada, United Kingdom, Denmark, Romania, Slovakia, Bulgaria, Czech republic, Finland, Hungary, Latvia, Lithuania, Malta, Estonia, Australia, Greece, Portugal, Cyprus, Slovenia, Japan, China, Sweden, South Korea, Indonesia, Taiwan, South africa, Thailand, Belgium, France, Hong Kong, Ireland, Netherlands, Poland, Spain, Italy, Germany, Austria, Israel, Mexico, New Zealand, Singapore, Switzerland, Norway, Saudi arabia, Ukraine, United arab emirates, Qatar, Kuwait, Bahrain, Croatia, Malaysia, Brazil, Chile, Colombia, Costa rica, Panama, Trinidad and tobago, Guatemala, Honduras, Jamaica.